How can you hide a volcano? Apparently, making it the highest mountain on the continent is a good start. Mount Elbrus is both Europe’s tallest mountain and Europe’s highest working volcano. The first fact is commonly recognized, and can be readily found on-line and off-line, but the second fact is harder to locate. While Mont Blanc’s standing as Europe’s highest mountain has long been overthrown, Etna remains on its pedestal, and its label as the tallest volcano within continental Europe is confirmed by sources as authorative as the BBC, Yahoo, and crossword365.com. Arguments are thrown about: Elbrus’ European credentials are questioned (but never when it is just a mountain), or it is considered too inactive to qualify (in spite of being as active as Vulcano itself). Perhaps it is just because it is in Russia, and not nearly as accessible as Etna? Between the Black Sea and the Caspian Sea is one of the wonders of Europe. Located in a stunning mountain chain, Elbrus stands above it all. This is the volcano that couldn’t stop growing. 300,000 people visit it each year, and each year it kills some tens of them. The people are drawn in by the beauty, the challenge, and perhaps also by the danger. And now geologists are taking a new interest and are finding signs that this volcano is restless. It is well worth taking a closer look. The Caucasus is a tell-tale sign of a continent in collision. It is a narrow mountain chain, 1300 kilometer long and running from the Black Sea to the Caspian Sea. To the south is the fascinating country of Georgia, with its fabulous ancient monasteries, its lively capital and slightly dubious but ancient wines, grown here for over 6,000 years. To the north are the endless steppes of Russia. Look harder and you’ll see that there is a second mountain chain. The one usually mentioned is the Greater Caucasus, but 100 kilometer to the south between Georgia and Armenia is a second chain, 600 kilometer long, called the Lesser Caucasus. The whole area remains tectonically active: there are numerous earthquakes, mostly minor but not invariably so. The largest one in recent years was an M7.0 in Georgia in 1991 which caused considerable damage. Similar-sized earthquakes were reported in the Greater Caucasus in 1742 and 1350, and in the Lesser Caucasus in 1899 and 1088; a particular devastating one appears to have occurred in 1139. The crest of the Greater Caucasus is an almost impassable barrier, and came to define the borders of many empires. Especially the southern slopes in the western part receive rather a lot of precipitation, 3-4 meters per year, largely as snow. The moisture here comes from the Black Sea. There are 1500 km2 of glaciers, now rapidly retreating due to the rising summer temperatures. The central area of the Greater Caucasus has the highest peaks. There are 8 peaks over 5000 meter (discounting satellite peaks). The Lesser Caucasus tops at just over 4000 meter. Mount Elbrus towers over them all: at 5642 meter it is over 400 meter taller than the next highest, Gora Dykh-Tau. Elbrus is also the only one of the highest peaks that is not located on the high central ridge of the Caucasus. It has grown up about 10 kilometer to the north. Mount Elbrus is instantly recognizable by its shape because of its double peak. There are other examples of such shapes in the area. The highest peak in the Lesser Caucasus is Mount Aragats, in Armenia, 4,090 m high. It has four separate peaks, imaginatively called the Northern, Western, Eastern and Southern peak. Like Elbrus, Aragats is a volcano with holocene eruptions, and like Elbrus, it is slightly off the main chain of mountains. The other 5km+ volcano here, Mount Ararat, is also a double, although in its case the second peak is a mountain in its own right, 13 kilometer away. These three are compound, polygenetic volcanoes. The magma chambers are strong and stable, channeling their output to the same small area over long periods of time, but with more than one outlet. Both Aragats and Ararat are Asian volcanoes, whilst Elbrus is counted as European. Of course this depends on where the border between Asia and Europe is assumed to be, which to some degree is an arbitrary choice. Borders of regions tend to follow mountain chains or rivers. Nations, of course, prefer this because these features aid border security. Along the southern border of Russia, the watershed of the Caucasus is the most suitable feature, and the border between Georgia and Russia runs (apart from some disputed regions) over the tops of the mountain chain. Mount Elbrus is well to the north of this, and thus falls within Europe (and within Russia). 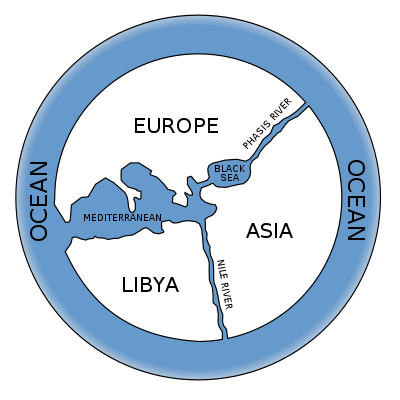 Earliest definition of the three continents, from the map of the world by Anaximander (6th century BC). A slight lack of geographical knowledge of more distant regions is apparent. But there have been different conventions in the past. The Greeks, in the 6th century BC, put the continental boundary along the rivers Volga and Don, north of the Black Sea and the Caspian Sea. They would have considered this to be the ultimate border of civilization. With some minor re-drawings, this convention remained until the late 18th century, when a German textbook proposed the Kuma–Manych Depression as the natural border, as the lowest point in the region. This choice did expand Europe to the south, but had the disadvantage that it isn’t a clearly defined line, but a fairly broad valley. Since the late 19th century, the Caucasus has been taken as the continental divide, although in the Soviet Union the Kuma–Manych Depression remained the official definition until the 1950’s. It is notable that the expansion of Europe followed the conquest of the region by Russia – where Russia went, Europe followed. And so, over time, as the border shifted southward, Mount Elbrus came closer and closer to Europe, until it finally jumped across. The ancient Greeks would have considered this as leaving civilization. In modern days, the European credentials of Mount Elbrus are strong, and the discussion is about when, not if, it became European. 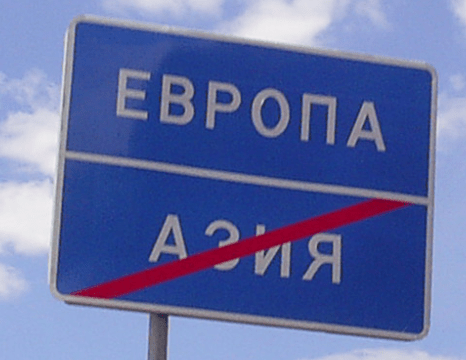 No significant challenge has been made, and Elexit (Elbrus-exit) is not on the cards. The laid-back locals. Whether Asian or European, they are not to be trifled with. The term ‘Caucasian’ is used for light-skinned people, suggesting that these came from here. But this is far from the truth. (Note that ‘Caucasian’ covers a range of skin tones.) During the ice age, an isolated group of hunter-gatherers appears to have survived in the region. After the ice age, their genes became incorporated in the migration that brought the Indo-european languages to the west, argued to be by horse-riding hunter-gatherers from the Caspian area. But the same Caucasian gene pool also contributed to the neolithic farming invasion, spreading from the Fertile Crescent. The Caucasus acted as a divide between the two flows, but both picked up genes from here. Many migrations passed through the area, and peoples came and went. This left its trace: the language diversity is huge, with four language families (Caucasian, Semitic, Indo-european, Turkic) and 50 or more individual languages. In addition, there is also a Mongolian language, not part of the four families, which survives here. It is a tribute to the huge variety of people passing through and settling at this cross roads of the continents. There are some 3-meter tall megaliths and smaller dolmens here, which may date back to the Scythians, invading from the west, or which may remember other, forgotten peoples. Here are some of the most ancient churches and monasteries in the world, but also some of the oldest Islamic places. The Mongol hords passed through on their way to Egypt. It became the border of Kublai Khan’s empire, and afterwards the border of the Golden Horde. A powder keg it always was. Nowadays, Mount Elbrus is in the Kabardino-Balkar Republic of Russia. The local population consists of Adyghe, Balkar, and Russians. The Adyghe, or Circassians, had some reputation. A British traveler in the 1830’s wrote: “The sole pursuit of the Circassians is predatory war against their neighbours” and “a martial people, trained from infancy in the midst of arms and early habituated to systematic plunder”. They were displaced after the Russian-Circassian wars, when over a million may have died. The opponents were no less brutal. Leo Tolstoy, who was in this war, wrote “It had been the custom to rush the auls [mountain villages] by night, when, taken by surprise, the women and children had no time to escape, and the horrors that ensued under the cover of darkness when the Russian soldiers made their way by twos and threes into the houses were such as no official narrator dared describe.” Since the Circassian genocides of the 1800’s, the majority of their population now live in Turkey. They speak a Caucasian language. The Balkar are indigenous people from further to the east along the Northern Caucasus, where they have lived since at least 1100. The closely related Kardachay Republic uses Mont Elbrus as its emblem. Both the Kardachay and Balkar are Turkic people, who spread from Asia during the 6th century when the Turkic empire stretched from Mongolia to the Black sea. The entire Balkar population was deported to Siberia and Kazakhstan by Stalin; the survivors were only allowed to return a decade later. The Russians arrived with their century-long conquest of the region, which ended in the 1860’s. This area has been a melting pot, shaped by war. The dreadful reputation which predates the Russian invasions are perhaps an indication that the local resources were limited and trade was difficult. Mountainous regions, in the days before tourism, were invariably poverty-stricken. But this area also always felt the brunt of the waves of invasions from the Asian steppes, from the Huns to the Mongols, and self-defence may have played a role. And Mount Elbrus became an unlikely battle field in the second world war when German armies got sidetracked by trying to conquer the mountain. As in so many places in Russia, a monument has been erected in memory of this war. Understanding the Russian mindset, and its melancholically-inclined culture – and beautiful singing – begins with seeing the devastations brought in the second world war. Although, it is recommended not to inquire too much in how much of the devastation was self-inflicted by the merciless regime of the days. Mount Elbrus includes both the highest and the second highest peak in Europe. The two summits are about a mile apart. The Western summit is the highest, at 5642 meter. The Eastern peak is marginally lower, at 5621 meter. In between lies a shallow saddle, at an altitude of 5416 meter. 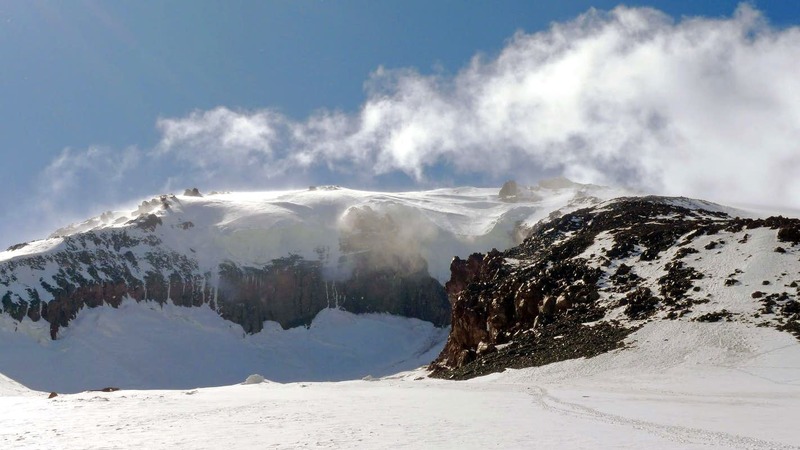 The Eastern peak is the youngest; it has a crater bowl around 300 meter in diameter and 80 meter deep, but it is filled with snow and ice and the true summit can be hard to locate. The crater is open to the east, from where a long lava flow has descended. 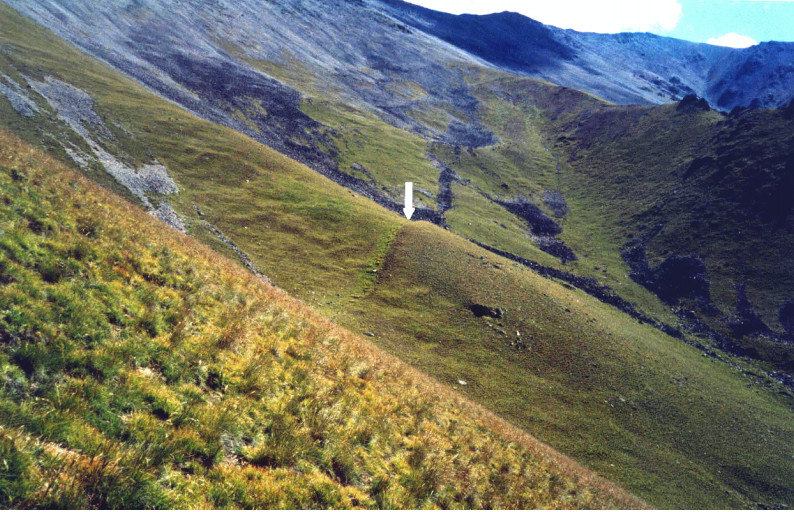 The Western summit is much older and is eroded; a vertical fault has removed part of it. The summit is at the northwest rim of a 250-meter wide crater. A small pyramid identifies Europe’s highest point. A minor fault crosses the two summits, and a number of small volcanic cones lie along this fault, in the river valleys towards the west: this fault has clearly been hijacked for magma transport. Mount Elbrus is built up from dacite lava breccias and rhyolite tuff, covered by extensive lava flows. Most of the Holocene lava flows descend steeply into the river valleys and consists of rough, viscous a’a lava. But the more recent cover also includes significant explosive debris. The longest recent lava flow runs 24 kilometer to the north-northeast, from the Eastern summit. There are some fumaroles at the Eastern summit and along the flanks. 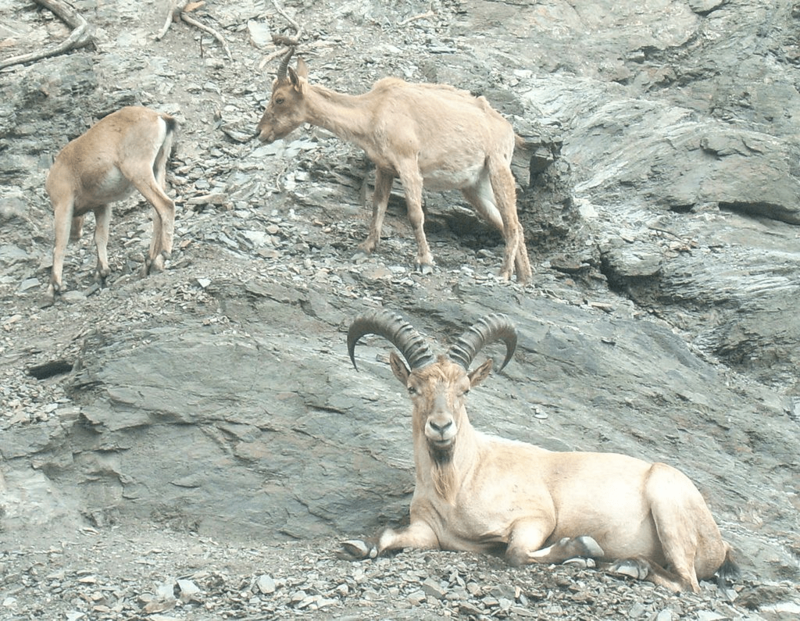 All indications are that the activity has moved from West to East, and the Western peak may be largely extinct. The Eastern one seems very much alive. Mount Elbrus is covered in tens of glaciers, not surprising in view of its height and location. The glaciers are now receding, and in places are thinning by meters per year. It is part of the world-wide decline in glaciers, related to summer temperatures. But especially on the Eastern summit, there may also be some melting due to increasing ground heat. The glacial retreat has caused lakes to form on surface previously covered in ice. In 2006, a glacier dam broke through and one of the newly-formed lakes caused a flood down the mountain, destroying a resort. Luckily this happened at night when there was no one at the resort. Retreat of the glaciers” The ‘T’ indicates the old level. Click on image for higher resolution. Mount Elbrus is secure in its status as the largest volcano in Europe. But is it active, or is it extinct? Should it be placed above Etna in the European rankings, or is it just a mountain with a volcanic legacy but no activity? This is another fairly recent change in our knowledge. Previously, it was considered inactive, doing nothing of interest since the Pleistocene. But in the 1980’s this view changed, and evidence for much more recent eruptions was found. In the 1990’s, it changed status to potentially active, and according to some, pre-eruptive. But let’s first look at its older legacy. 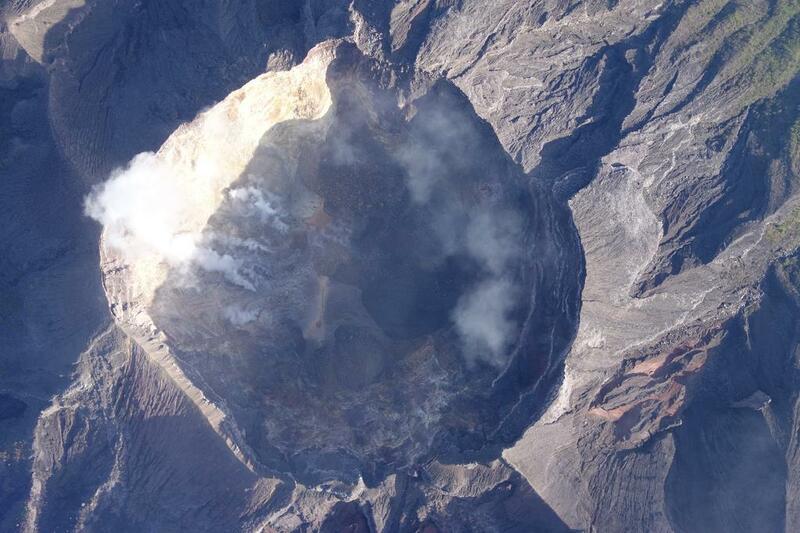 The volcanic activity in the area goes back some 8 million years, but it was not always at the same location. Over the past million year, the activity migrated slowly to the west, until the story of Elbrus-proper began around 340 thousand years ago. This is the age of the oldest well-dated deposits which left ignimbrites hundreds of meters thick, exposed in the various river valleys. 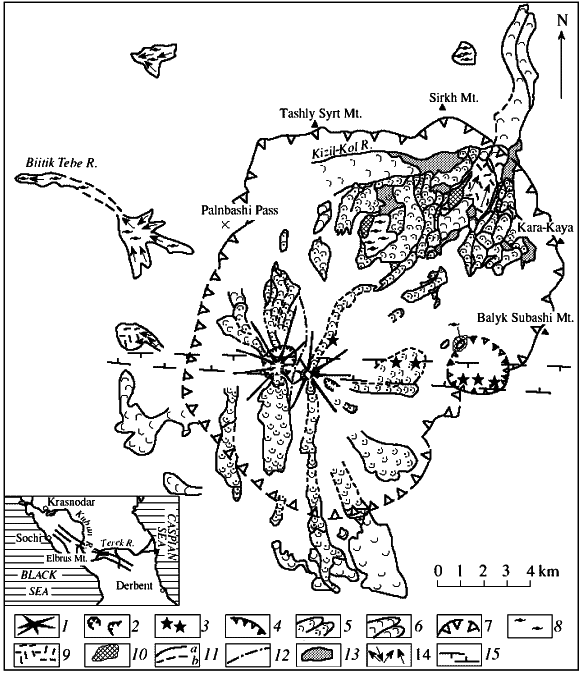 The early caldera cycle ended 250,000 years ago with a large explosion which levelled the newly-built mountain and created a caldera 17 by 14 kilometer diameter, 230 km2 in area. It is still (just about) visible in the landscape: Mount Elbrus grew up inside this caldera. Much older ages for this caldera, in excess of 600,000 years, have also been proposed. After the caldera formed, a resurgent dome formed, but otherwise the area went rather quiet. Eruptions, both magmatic and explosive, resumed 170,000 years ago, when over time 2 kilometer thick lava build up a new edifice. The current structure was in place by 60,000 years ago. There have been eruptive cycles since, both in the pleistocene and the holocene. The volcano structure is not as tall as it may seem. The base of the volcano is 3500 meters high, and only the upper 2 kilometer of Elbrus is the actual volcanic cone. It is about 15 kilometer wide, and thus fits neatly into the old caldera. The modern cone is clearly the same volcano as the one that caused the caldera. Over that time the magma outlet has hardly moved. But the composition of the magma has changed. The oldest lavas consisted of around 60% mantle material and 40% crustal melt. The newer deposits have 80% mantle and 20% crustal melt. Thus, over time the mantle has become more dominant for the source material of Elbrus. Although currently quiet, this volcano is no longer considered extinct. Volcanic debris provides evidence for at least four strong eruptions of Elbrus over the past 7000 years. But dating these has proven difficult. Much of the lava came out at altitudes over 3 kilometer, where no vegetation grew and therefore radiocarbon dating lacked carbon to work with. The various sites describing Elbrus normally state that the last eruption took place around 50 AD, a claim that comes from an older paper. But it is not that simple. Carbon-containing materials have now been found underneath or embedded in some of the lava flows, sufficient to allow for radiocarbon dating. The earliest attempts showed three episodes: the oldest (7200-7500 years ago), the middle (4600-5500 years ago) and the youngest (around the year zero). Subsequent dating of fossil soil and charcoal found ages of 6250 ± 50, 4270 ± 40, 1330 ± 80, and 990 ± 60 years BP. Other authors find different dates, with major eruptions 39±5, 28±3, 23±2, ∼21, ∼9.2–9.3, ∼7.8– 8.0, ∼7.2, ∼6.0, ∼4.9, and ∼4.6 thousand years ago and during the first and second centuries A.D. Two fairly accurate measurements have come from carbon dating of paleosoils, covered by volcanic debris in the river valleys. The debris was washed down by the river, after its flow was dammed by lava. The buried soils were dated to 6410±100 years ago and 1780±70 years ago. The first date is consistent with the 6250 ± 50 event, and the second one was probably the event dated previously to 50 AD or the 1st and 2nd century AD. The radiocarbon dates suggest that the mountain has erupted since, as recent as 1000 years ago. But there has been further, undocumented activity. 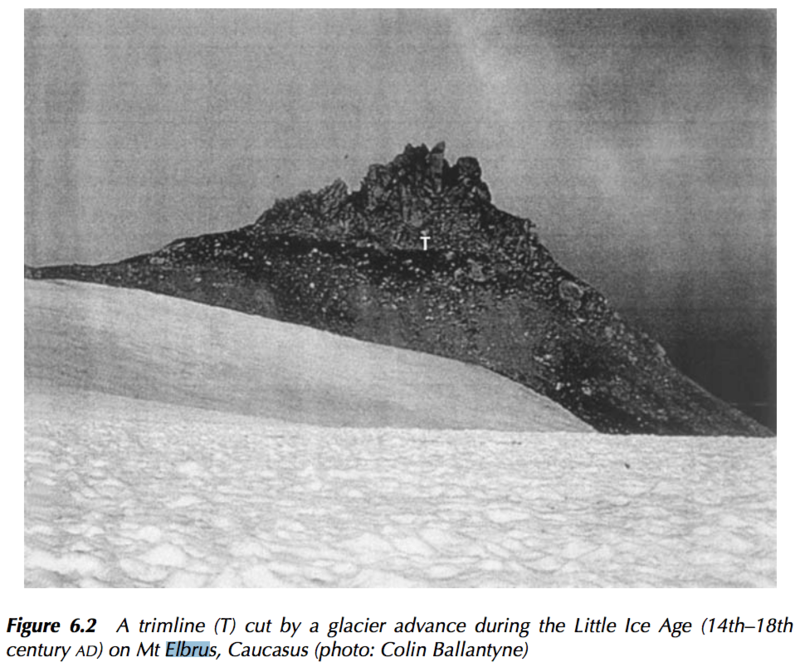 An ice core going back around 500 years showed a number of volcanic horizons, including one from Katmai 1912 and one from a large eruption in 1840. But there was also an (undated) local event, as shown by inclusions of grains which could not have traveled far. This shows that the mountain was active within the past 400 years. Dislocations in surface features show that over the past 7000 years, there were also at least five earthquakes with a magnitude of M = 6.5–7.0. The eruptions and earthquakes do not coincide in time: the area is both volcanically and tectonically active, but the two appear not related. Paleosoils associated to earthquake dislocations have been dated to 5600, 3900, 2400, and 1600 years ago. The vertical displacement of the last event was at high as 3 meters. All of the events were accompanied by large rock avalanches. There is also evidence for simultaneous damming of rivers in the area, at a time that could be coincident with the Terek earthquake which took place in the North Caucasus around the year 1688, and may have been as large as M6.5. 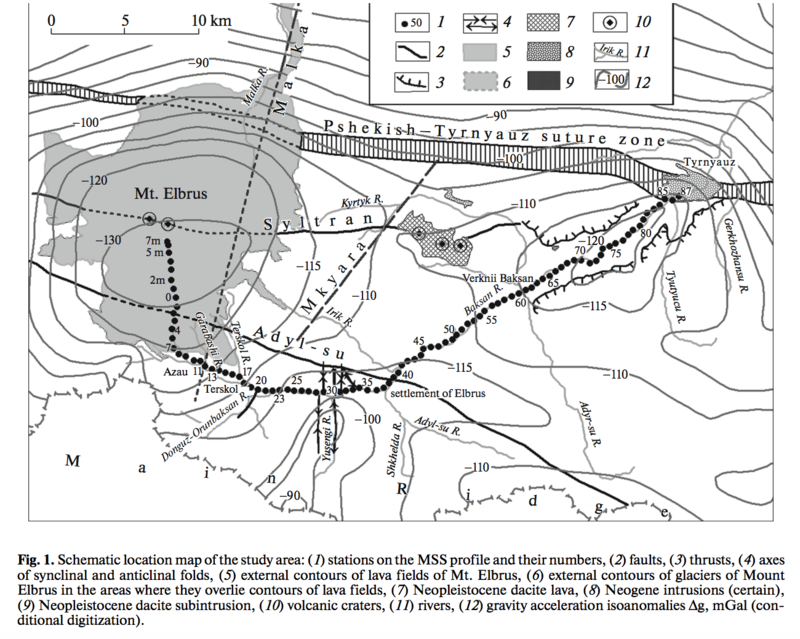 Evidence that Mount Elbrus still has an active magma chamber was published only in 1984, when a magma chamber was suggested to reside at depth of 0.5km-2km below sea level. Seismological studies have measured the seismic velocities underneath Elbrus. Low velocities indicate melt. As expected, there were low velocity zone underneath Elbrus. But there was another one to the east: not all magma here is Elbrus. The picture shows a study by Rogozhin et al., 2016. The grey lines are gravity contours. They show a strong negative anomaly (so low density rock), a little to the south of the peaks of Elbrus. The suture zone (fault) to the north is an active earthquake zone, but due north of Elbrus it shows a gap, probably due to melt which reduces the stress in the zone. The open circles with the central dots show the volcanic craters. Two are on Mt Elbrus itself, and three are to the east. The black dots show where the seimographic data was taken. The picture shows the cross section along the line of the black dots. Elbrus is on the left. Red areas indicate low velocities: this is seen underneath Elbrus, and underneath an area to the far right. These are the main magma chambers. Clearly, there is a significant amount hiding at depth. But where did the magma come from? The wider Caucasus does not have that many volcanoes. It feels a bit like Mars: there relatively few volcanoes but the ones that do exist have grown huge. In fact, volcanoes are not usually present in collisions between two continents. The mountain chain that forms is a long crumple zone, but continents do not subduct and therefore the bottom is much less deep than in mountains which form from oceanic-plate subduction. That means that not much melt forms. You get granite (lots) but no magma. Neither the Pyrenees, the Alps, nor the Ural (Europe’s other continental collisions) have volcanoes. The Himalayas does have a little volcanic activity, but that mountain range is huge with very deep roots. So why does the Caucasus have volcanoes? An indication comes from the fact that the major volcanoes, Elbrus, Kazbek, Agragat, and Ararat, are all located along the Trans-Caucasus transverse uplift, a broad zone that runs roughly north-south perpendicular to the mountain chains. Elbrus lies along its western edge, and Kazbek along the eastern edge. This region appears to show some extension, and this extension may be source of the magma. It remains unclear why in this large region, only a few major volcanoes have grown up, rather than more smaller ones. It appears plausible that the magma generation rate is too low to reach the surface by itself, but requires tectonic faults to provide a pathway. The main volcanic centres indeed appear to be associated with a few major tectonic faults. There has been more significant volcanic activity in the past. Between 2 and 3 million years ago, an area on either side of the Lesser Caucasus was flooded with basalt. This has been called the youngest and smallest flood basalt province on Earth. It runs from northeast Turkey to northern Armenia (a volatile region at the best of times), covers an area of around 15,000 km2 and an eruptive volume of around 2250 km3. This is what fertilized the Fertile Crescent: the Garden of Eden grew on a fissure eruption. The current collection of massive volcanoes are little more than the explosive afterthoughts. 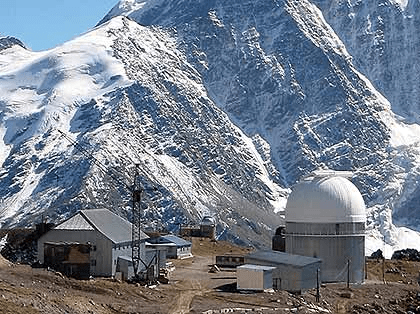 In the 1970’s, an astronomical observatory was build on the southern slopes of Elbrus, at a height of 3100 meter. The main instrument is a 2-meter telescope (the size refers to the diameter of the mirror), and there are several smaller domes with telescopes up to 60 cm, used for research ranging from the Sun to extrasolar planets. It is an impressive location, and the hike up from Terskol village is popular with visitors, and commonly used as an acclimatisation hike before climbing Elbrus itself. The observatory was run as a joint institution of the Ukrainian and Russian academies of sciences, but in these more troubled times the agreement apparently is on hold. The world of science cannot remain entirely independent of politics. The observatory is now solely run by Russia. This is currently not advised. The UK Foreign Office advises against all but essential travel to Kabardino-Balkaria, and this includes the Elbrus area. The area is not as dangerous as it was a decade ago, when terrorist attacks spilled over from nearby Chechnya, but a risk remains and kidnapping is also a real threat. If you still want to go, be aware that getting the visa can take a few months. The permit for the park costs 50 rubles, to be paid locally. Check that the travel warning does not invalidate your travel insurance. And use a reputable travel company with experience in the area. Mount Elbrus is one of the ‘seven summits’, the highest summits on each of the continents. The full list is Kilimanjaro (Africa), Denali (North America), Elbrus (Europe), Aconcagua (South America), Carstensz Pyramid (Papua, Oceania), Vinson (Antarctica); Everest (Asia). As an interesting side, Elbrus is the only one of the seven liable to erupt underneath your feet! In spite of this, and in spite of the travel warnings, it is in high demand by people wanting to conquer at least some of the seven. The climbing season runs from May to September. During July and August it can get busy on the mountain. The climb is only of moderate difficulty but the height requires acclimatisation and ability to handle snow and ice, and the ascent is long – and don’t try to kill your guide. And like Everest, people do die on the climb most years, in fact it has a very high ratio of fatalities to climbers, perhaps because the mountain attracts novice mountaineers with its promise of smooth slopes. 20 fatalities per year is not uncommon! The usual approach is from the southern side, uses tracked vehicles to get to base camp, climbs to get up to Lenz Rocks camp, and from there the summit assault is done in a single, long day. If the weather is not too great, the summit day can be done from the High Camp but that makes for a very long and hard day. If you are not up to the full climb, a Snow Cat can be used to get up to the saddle between the summits, from where you can join the climbers. For the adventurous, the descent can be done on skis. The north side can also be climbed but this is significantly harder, involves camping rather than using huts, and requires a high level of fitness. The mountain remains dangerous. Even if not erupting, it has a habit of killing the people trying to conquer it. It also goes after the people who committed the crime of living nearby. On September 1 this year, a mudslide hit the town of Elbrus and although fatalities were light, the entire area had to be evacuated including both Terskol and Elbrus. Both the main road and the gas pipelines were badly damaged in multiple places. The evacuations were done by helicopter as all roads had become blocked: over 1000 people were carried to safety this way to the nearby town of Tyrnyauz . 40 tour groups became stranded on the mountain, including 12 groups of foreigners. And this was not the first such event. 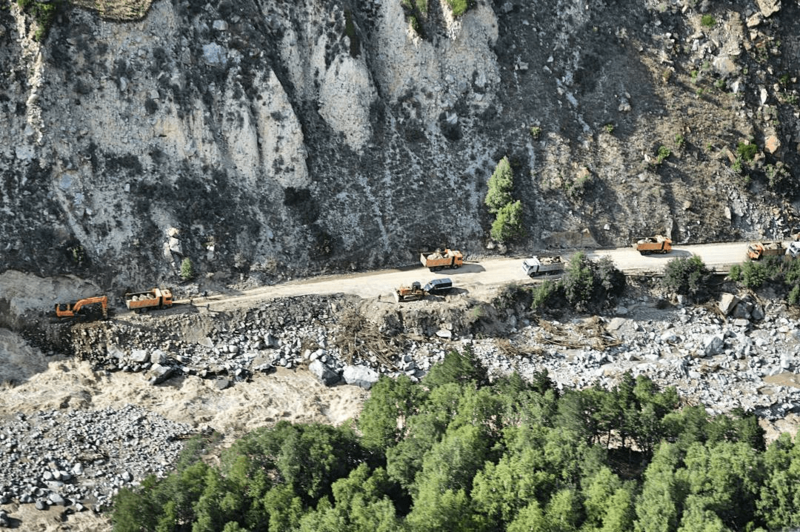 On August 14, Tyrnyauz had itself been hit by a large landslide, necessitating an evacuation. This is not a mountain that takes disturbance lightly! It demands respect. And one day, perhaps soon, perhaps not, Elbrus will again respond to our intrusions with fire, ash and smoke, and lava will come flowing down the glaciers. What a sight it will be, to see Europe’s highest summit burst in flames. One day. And to end, perhaps not the best ever view of Elbrus, but a low-res copy of one I took myself, 30 years ago, at a time when it was still considered a tall but safe mountain, rather than a volcano at risk of erupting. Radiocarbon dating of holocene eruptions of the Elbrus volcano (North Caucasus, Russia). O.A.Bogatikov, Doklady Akademii Nauk, 1998, Vol. 363, pp. 219-221; O.A. Bogatikov, I.V. Melekestsev, A.G. Gurbanov, D.M. Katov, A.I. Puriga, Dokl. RAN, 363 (4) (1998), pp. 515-517; Doklady Earth Sciences. V. 363, pp. 1093-1095. The Elbrus Caldera in the Northern Caucasus: Geological structure and time of formation. A. G. Gurbanov, O. A. Bogatikov, I. V. Melekestsev, P. W. Lipman, J. B. Lowenstern, D. R. Miller, and A. Ya. Dokuchaev. Russian Journal of Earth Sciences, 2004, Vol. 6, No. 4. Ancient earthquake dislocations in the area of Elbrus Volcano, North Caucasus. E. A. Rogozhin, A. G. Gurbanov , A. V. Marakhanov, A. N. Ovsyuchenko, A. V. Spiridonov, and E. E. Burkanov. Thank you Albert! Fascinating and informative as ever. I knew nothing about Elbrus and the area so I learnt a lot from this. Do we know if the volcano is monitored? The wider area is monitored with seismographs because it is an earthquake zone. No GPS monitors I am aware off. Glacial area are difficult to monitor. Elbrus has become a priority for scientific studies in Russia but it seems the people doing the work are not a large group. I am not aware of any non-Russian programs. Elbrus has fascinated me ever since i visited the area in the 1980’s, and this post had been planned for over a year. Still it was not easy to write, because of the difficulty in pulling all the information together. And you’ve just reminded me, there’s a Scythian exhibit at the British Museum till January. Looks good. Just looked back through the Europe volcanoes post, and saw the part that mentions Elbrus being two separate volcanoes together, but that doesn’t seem to be accurate really? Different note, any know if it’s possible to find out about current alert levels for PNG volcanoes? No, I wouldn’t have written that now.. The two feed of the same magma chamber, even though they erupt independently. The main question that I have about it is what/where is the source of melt? Is there a subducting slab forming in the area? With a convergent margin that’s a possibility. Is there an old slab getting melted? Is the magma source ultra deep? If so, this could be a the first provable manifestation of ringwoodite dehydrating at ≈670 km. (Other papers pointed to it being a water bearing mineral, but no one explicitly claimed that it dehydrates at 670 km.) I have wondered if the slabs that hang vertically could have a second melt zone that leads to greater melt production under places like Pinatubo, augmenting the production from the 110km depth. Elbrus could be fed from the last vestiges of the Tethys seafloor crust melting out. If so, that would be pretty cool. My other idea is that when part of the Tethys crust detached following subduction, that the eddt currents behind that detaching slab could have caused the volcanic flare up along the Italian penensula roughly 40 kyr ago and been the actual cause of the Laschamp geomegnetic excursion. I have not seen any indication that anything like this for the Columbia flood basalts 20 myr ago… I also don’t know if anyone has actually looked. Yes, I had been wondering about it but could find no clear papers on it. The only real suggestion was that of extension, but this was only in a few papers, although I could also find no papers aginst it. The magma is mainly from the mantle, with a smaller amount of crustal melt which must be important – it is not a subducted plate. The crust is not that thick here (it is not a craton) but of course any mountain chain has deep roots. My preferred idea is indeed that it is related to the demise of the tethys, which wasn’t that long ago. Which is also another possibility, it could be remnant of back arc spreading from a previous subduction zone. … so, where would the old arc volcanoes be at? You could extend this question for all the Anatolian volcanoes as well as well as Mt. Damavand and the few volcanoes in Iran. It’s difficult to be completely sure, but it looks to me that Agung may be steaming with considerably more vigour this morning. More on Agung. Interview with Vulcanologist Devy Kamil Syahbana. Thanks Albert for exciting and informative reading! Learnig a lot! 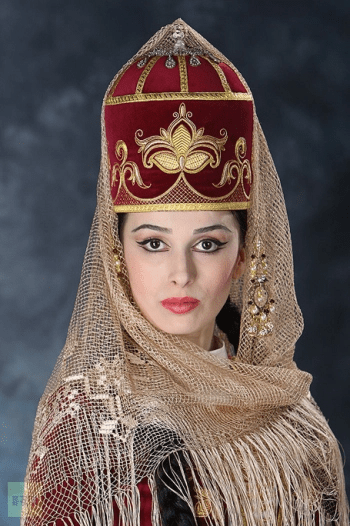 Off topic – Circassian women were widely famed for their beauty: pale skin, long hair reaching their knees or ankles. They were sold or captured into Arabian harems, where they ruled without contest. The men are incomparable horsemen, and would work as mercenaries for warring factions, but they have also been massacred by those factions, finding themselves in the way of warring armies of East and West. They came to European notice during the Crimea. Their national dress and flag are testament to their clearly defined identity. There are some lovely photos online. Yes, a lively history! But I did not want to go into the reported beauty of the women as this was directly related to slavery. Circassian women were more expensive. It was a dreadful part of their lives, dressed up in positive-sounding words by the men who bought them. Sometimes I feel embarrassed to be part of the human race, when it feels like a race to the bottom. And while waiting for Ophelia (we are right at the edge of the warning zone), just now I noted that the Sun appeared through the cloud and it was bright red. The colour you associate with a sunset but this was high up. What caused this? Water clouds tend to be grey, not coloured. Could it be dust? The airflow is not from the Sahara but if sand blew out over the south Atlantic Ophelia could have picked it up. Has anyone else noticed this? Bu now the Sun has gone as the clouds are thickening. No wind yet. Dunno, but around here if you get those funky gold / purple skies you have a really nasty storm system coming in. Usually nasty enough to spawn tornadoes. The local atmospheric physicists have said that the red sun was related to Saharan dust in the sky. In the south of England, it was on the cars. The fires in Portugal have also contributed. And the UK metoffice thinks it is mainly the forest fires in Portugal and Spain, and not much Saharan sand. Clearly the forest fires in Portugal which were catastrophic yesterday killing more than 30 and many more disappeared. It was simply the worst day ever in Portugal in terms of fires. In a summer that was just the worst. It was due to Ophelia strong warm southerly winds. Temperature was above 35C in most of the coast. Just unheard of for mid October. It was a massive disaster in Portugal. 41 dead plus many missing. It´s the second massive set of fires in just 4 months. Temperature was just insanely high, and strong southern wind. Ophelia contributed but the record warmth was already there in days before. This summer and last summer were just insane in Portugal. Climate warming seems considerably faster in the past 24 months. California also suffered a disaster too, in recent weeks. But hey, let´s just be real: climate change is just a Chinese conspiracy. Left London after daughter’s Graduation ceremony at 2:40 as the sky looked hazy and slightly brown with plenty of low cumulus under it. As we travelled south back home it got so brown and dark the street lights were on and it looked like twilight! A bit apocalyptic looking. Now we are home (near Gatwick) at 17:00 it is a lot lighter but still very a sickly yellow. We often get Saharan sand in our rain, but never seen it quite like this! I’m in Brighton and it went very dark here. Lots of fun and an excuse not to work for a bit. Several flights reported the smell of smoke in the cabin so assume it is the forest fires as you mention below. Same phenomena here in north Scotland. Ophelia very mild here. Just rainy and a bit windy. Like a normal gale. We are going through the center of the storm now. This hurricane was considerably weaker than I expected. Even in Ireland it was not as bad as feared. Thankfully. Still and sadly there were casualties. Yes, very sad. Glad to hear it’s not too bad where you are. Stay safe! Took a group of students onto Wandsworth Common this afternoon todo a spot of quadrat sampling. Ended up becoming a meteorological lesson. Luckily having lived in Saudi I had seen today’s type of weather many times so could explain the sky and sun. Do you not get similar effects with volcanic ash downwind? I remember the sky after Buncefield Fire, (felt the shockwave as well). A question re Ophelia. Is there a scenario where if it had tracked through earlier in the year when things are warmer that it could have maintained a cat 1 status? I assume not as the sea temperatures this far north would be too cold but am wondering. Look at hurricane Faith in 1966. It is possible. So, they already knew how the other half of the elements heavier than Iron formed? 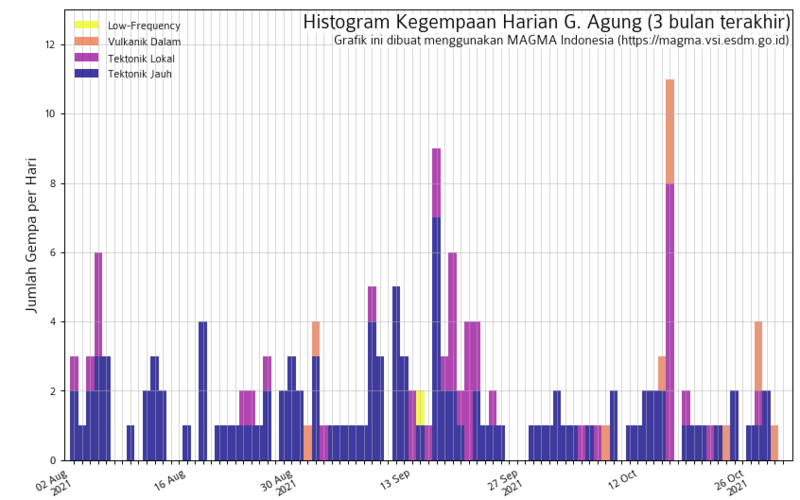 On Agung I finally found what I was looking for today; a seismic energy graph. Interesting; peak was on 22/9 and it’s been downhill all the way since then. Way too soon to say what way it will turn of course. This makes it look as if it’s returning to background levels. That , though, doesn’t seem to stack with other evidence. The steaming and the deformation for example. I’d be grateful for further views on what this might mean. Thanks Mike. It’s good to have something make me think in the mornings. Could someone please have a look at this video and explain what they see . Could it be earthquakes or man made noise. Could BOB be awakening from his slumber this has been like this since early this morning. Dunno, I have been puzzling over the accelerometer signals of an oak tree. (Yes, I really have. A conversation with Albert instigated it, though it’s not his fault. He’s been pointing out reasons that I am not seeing what I expected, and cluing me into false signal sources.) Right now I have 445 Megs of data on a tree doing… nothing. *sigh… not the first time I’ve had a large amount of data on a thing that wasn’t actually there. It certainly appears that way and also Tenerife, the weather is ok at the moment so probably not weather related. I do find it quite frustrating when somebody like myself without much scientific knowledge but with a genuine interest in volcanism asks a question but nobody seems to want to answer us novices!! Please guys keep this forum an open debate platform where we can all learn by sharing our individual knowledge. I did my sharing back when Bob was doing its thing. I got falsely accused of hacking so I don’t really have an interest in lifting a finger on the matter. If things go bad in a grand way, it’s all on the twits in charge. If it is a smooth excess at low frequencies seen at more than one island, you should consider wave action. If that is what it is, things should settle down now that Ophelia has passed. Looking at the graphs for the past few days, you can see it come up over a couple of days. There are many things that can cause low frequency vibrations, but water and wind are important ones. As to the youtube above, it doesn’t say what it is about. Date and location? there were a few minor earthquakes in April, so could it be something historical? Thank you Albert, seems strange its only showing on two and not on others unless IGN have them set differently? Not out of the question, they’ve done it before. It was the 15th October Gran Canaria thank you for your explanation about the signal. The station I think is EOSO (HHZ) . I have looked at the HHZ data from Oct 15 and the vertical bands are not there. I think something has gone wrong somewhere, perhaps a wrong date was linked on the web site. As to the horizontal stripes, yes, they are almost always due to local effects. The HHZ plots also show higher levels at all frequencies between 8am and 4pm, obviously of human origin, such as traffic. I did check the weather and the and the waves and it did not look to be because of bad weather. I am also trying to learn and have been watching all the islands and activity seems to be picking up on all the islands. They all have the red bands on the bottom which I thought was a sign of activity .IGN seem to be burying their heads in the sand again. Avcan posted that there were two earthquakes on Gran Canaria which look like earthquakes as per the video I posted but IGN have in a way told them they are talking rubbish. Could you give any nice links? Thanks, Very nice! Looks like el Hiero is a litle bit more noisy today, but nothing dramatic.. I tend to think that if there’s defined horizontal bands on SSAM like that – relating to several specific frequencies, then it’s probably just wind vibrating things on or around where the instrument is placed, a transmitter aerial or the instrument housing. Totally non-expert opinion – but this seems common on local (NZ) SSAM charts in windy conditions. just spotted that https://en.wikipedia.org/wiki/Mount_Sidley is not present in the GVP list for antartica – seems like it may have gone into hiding ? 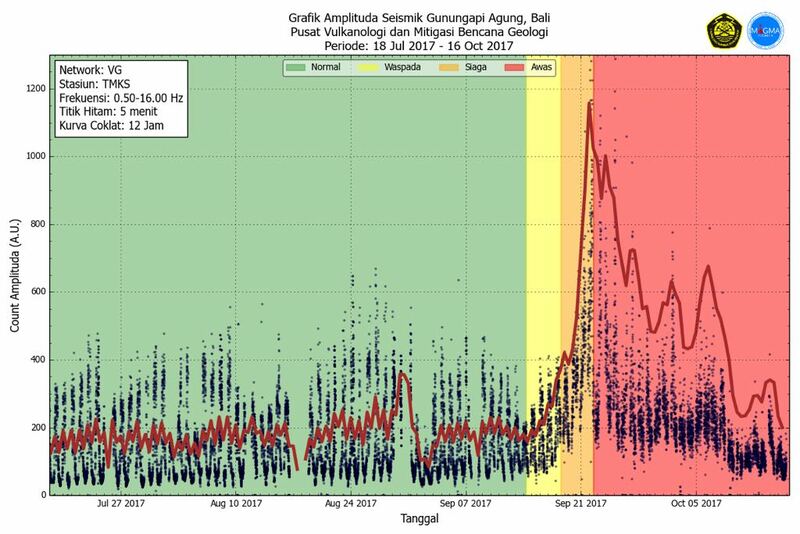 Since 03:30 Bali time, Gunung Agung brittle fracturing has picked up quite a bit. Some hints of fluids on the move, too. just clicked that link, now showing a bunch of red in amongst the blue – what is that being used to represent ? Screen cap + some red boxes highlighting some very “wet” quakes as Carl has called them in the past. Disclosure – I’m not an expert, but these quakes definitely are different than the typical volcano tectonic quakes that have predominated the story here. Hope it is of interest! That will make the owners of the drilling operation quite happy. Liability for the event has been a long running issue. Don’t know the details, but I think some of the people involved with company are also well tangled in the politics of the region and their opponents have been beating them senseless about it. Seems to be quite a bit of activity with the steam on Agung’s summit. Quite a lot of steam. Just about possible there is some ash in the mix, but there are storm clouds around , so on balance probably not. But the steam seems somewhat…enthusiastic. I note the post by Mike Ross several hours ago….but I don’t understand the implications. It seems there is substantial heat at the summit, but does the apparent drop in seismic energy suggest that there is a calming influence at play in the mountain, or maybe that seismic energy is falling away due to less resistance? Webcam seems to be frozen atm….but it shows….what? Dark plume over the summit? To me it looks like the plume from a small explosion….very difficult to say. It is an optical illusion casued by clouds about mid height on the mountain, the dark “explosion” you see is actually the mountain itself revealed by the coincidental shape of the clouds. narf…..I see it now. D’uh^^ Thanks. I’m now in agreement on the dark “plume”. It’s a cloud in shadow, rather than anything particularly ashy. But having watched the cam quite a bit since their last sunrise, when the sky has been clear enough to see the summit it seems clear that the steam is pretty significant today. Much more so than I’ve seen it previously. Longest coda I’ve seen yet on the 21:30 trace. Just posted this above, but posting it here too – I believe it’s highlighted in the red box at the bottom for everyone to see. It seems to be back up now, on a very clear cloudless day, with only a very small puff of steam visible at the summit. The live seismogram had been down .- no trace on the chart for about 6 hours. It’s working again now. 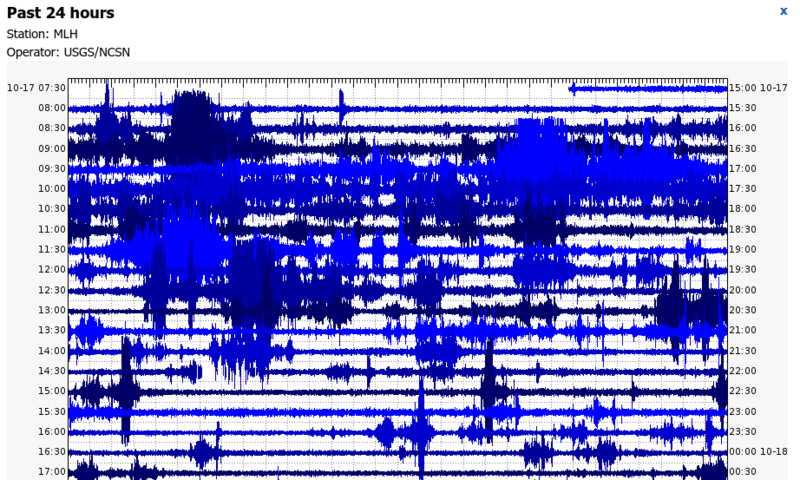 And a few minutes after posting that, the clouds move in and the seismogram goes down again. My fault. Looking at the depths, appears to be a slight hydrothermal “disturbance”. For water, this is about 22.064 MPa. For a column of water exposed to the atmosphere (via cracks or pores) this pressure is reached at just over 2.18 km. Below this depth no matter how hot you heat water, it will not make steam. However, water that is superheated that finds itself above that depth, can flash to steam quite readily. The “hydrothermal” comment by mjf applies to this. If the depth of the quakes are above 2.18 km… hydro-thermal is a definite (and likely) possibility. Keep this in mind when you look at seismic events in volcanic regions. In my experience, that transition depth shows up in a lot of seemingly abrupt quake swarms. How strong is a phreatic event? 6 August 2012 → Te Maari craters at Tongariro lofted ash to 6.5 km (based on a VAAC report of the time) If I remember correctly, it scared the bejeevous out of a hiking group. And for those who are not very familiar, one hazard that mountainous volcanoes always have, it the potential of lahar. This slurry of old ash, altered rock, trees, boulders plus other debris all mixed with water has the consistency of wet cement being poured down the valley or a stream. It is just as unforgiving. Lahar can form from violent shaking that destabilizes/mobilizes the material and makes it flow… and doesn’t have to be very wet to do so. Largely senisitive. Stack a lot of meters of water and the differences add up fast. But surely, the pressure in a fluid column is linearly proportional to the density of the fluid, so changing the density from 1030kg/m³ to 1000kg/m³ would give 2.18km/1000*1030 = 2.25km, not 22.25km. Thanks for teaching us! Very useful!! Agung is steaming well at the moment, nice to have the top of the volcano clear enough to see. Yes. Seems much stronger than for a fair while. Possibly getting dirty steam too. It’s been steaming at about the same rate (on and off) for several days now. I’ve had the cam up and running constantly in my shop (because it’s a quiet time of year ) so I’ve seen several of those moments when the summit has appeared for just a few minutes. I may be wrong, but I think the “ashy” appearance of the steam (at times) is down to darker cloud in the foregound rather than any actual discolouration of the steam itself. When I posted, very early morning in UK, (I couldn’t sleep,) it was going like a steam train and yes at times did look a little darker. However as Neil said I think the darker colour was a trick of the light because where it was billowing out from it was always initially white steam before appearing darker as it rose. I went back to bed around 5:00am BST and by then it was just wispy steam as it is now. Yes, it’s definitely sporadic. It waxes and wanes. Overall I would say it seems a little more pressurised than 7-10 days ago, but I would still describe it as “simmering” rather than anything more… ebullient . Do you want to see, how it looks actually inside the crater? It’s definitely white steam for me. Yes . Looks like steam to me, and as you say, there’s more of it. But maybe that’s down to recent weather conditions. I saw some quite intense rain there over recent days. Activity levels have dropped down for now. If you have a more precise method, that’s fine. It’s still greater that the precision of the seismic depth of a quake. Mainly it’s to get a. Idea of what processes could be in play. 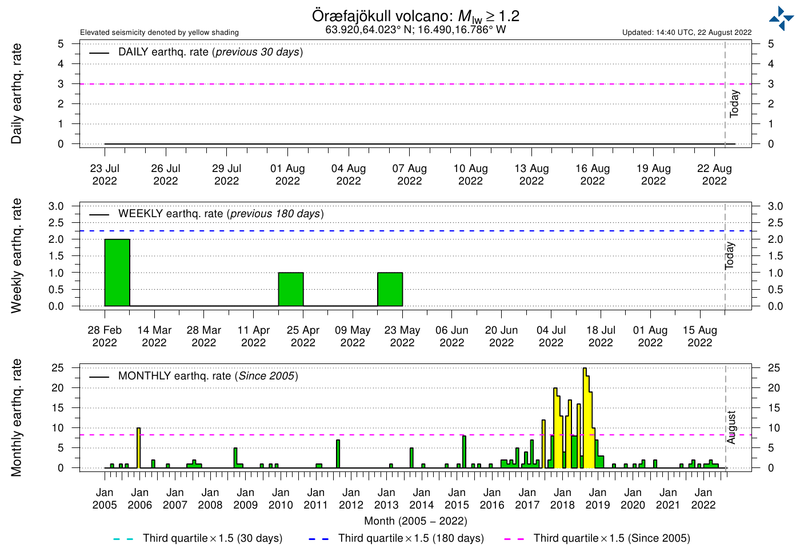 IMO may have to extend the range of their graph for Öræfajökull for the second time this year, as the number of quakes pr month just seem to be increase all the time. A small swarm of quakes at Askja also today. Small quakes but I don’t remember seeing this many quakes in that area for a long time, if ever. I may be wrong though as ill health has meant I haven’t been keeping up with Icelandic affairs as I used to. Anyone have any idea if this is of any significance or not? Nice to hear from you Frances! Thank you very much Inannamoon! Nothing shedding a few years and getting a working NHS wouldn’t put straight! Seriously though it is good to be feeling a little better after a year or more of very poor health. Great though to be reading such wonderful posts as this one from Albert! Really great and wonderful to increase my geographic knowledge as well as the small amount I have learned about volcanology from this website. Many thanks to all! ok – a health and safety check may be required before any human colonization. what is the red indicating ? I’ve seen that before and thought: “a way to show the clipped quakes”. Then it vanished and I wondered if it was just a glitch on the kit. They have been displaying it on and off. Not sure why they occasionally include it and then remove it. Southern part of the Ural has some rhyolitic outcrops, I know from my thunderegg sources, near Magnitogorsk. One wonders of that is because the last remnants of the Tethys ocean bed and bits of Africa went up and over the European continent as opposed to down and under?